It will not come as a surprise to learn that the true number of civilian dead in Iraq has now exceeded 800,000, while wounded, to a greater or lesser degree, amount to at least one million. For how much longer can the occupying powers hide these figures from their people? It goes without saying that every effort is made by these powers to hide and diminish, for their own purposes, these appalling statistics of destruction. It is no wonder, therefore, that millions of Iraqis have fled their country. Is it surprising that soon the invasion of Iraq will be recognized as the greatest disaster of recent times: unlawful, unnecessary, and arrogant in the extreme? While the world waits, the Americans and British seek to extricate themselves from the morass which they have created, and to do so with whatever dignity and plausibility they can muster. Certainly no triumphal banners are in order. The legacy is one of death, mayhem and abuse of power. Meanwhile the forces of reconstruction have set to work to mend the fractured walls, physical in Iraq and psychological elsewhere. The world awaits anxiously the unknown results stemming from this unhappy episode but the hopes of many are curiously high, some would say, without true reason. Did men but know it, the whole world is bracing itself for momentous changes, which will set to rights, not only the trauma of the Middle East, but the dangers and tragedies of Earth itself. Maitreya knocks loudly at the door. The door, soon, will open and the Lord of Love will step forward into the fray. When men see Him they will be astonished by the simplicity of His words but also by the clarity of His utterance. His wisdom will baffle and delight in equal measure, drawing to Him those who are ready to follow Him and rebuild the world. His name is Valour; likewise Strength of Purpose. The Great Lord comes equipped as none before have been, ready to do battle with all that ails and belittles man. There are many who smile at the notion of such a Presence among us, but soon all will come to know the truth of these words, and take their stand for or against Him. Thus will the Great Lord place before mankind the question of its survival. He will show that essentially men are one, no matter the colour or the creed, that the bounty of Earth belongs to all and that sharing of that bounty is the key to man’s future. Only sharing, and the justice which it will bring, offers hope to man. Only justice wrought of sharing will end the plagues of war and terror. Only sharing and justice can bring men to that Brotherhood which is their true inheritance. When men see this they will rise to the challenge and tackle one by one the many problems which daunt us now. Maitreya’s Light will support and balance men in their eagerness for the changes which must ensue, and, in right order, the world will be renewed. Thus will it be. Q. (1) In the French Presidential elections, voting machines were introduced for the first time in France, on the initiative of the Minister, Mr Sarkozy. Was there any fraud in the elections? (2) With the election of Mr Sarkozy, do the Hierarchy foresee forthcoming social unrests in France? A. (1) Yes, but a small percentage compared with some recent elections elsewhere. (2) Not particularly. Q. I am aware of the importance of Maitreya’s priorities but how can we apply them even in a new business? A. Think what the essence of it is. The essence of Maitreya’s priorities is the principle of sharing. You can start the business as the boss, employ 20 people, pay them as little as possible, make them work for the longest hours for minimum pay. That is common today. This is called the effect of market forces. It drives the life out of life. Market forces turn people into automata, pawns moved around by people in power. It is happening all over the world. People see it but it is happening so quickly and subtly that they don’t actually take it in: why am I earning less per hour, working longer hours than I did 10 years ago? Why is my standard of living falling though that of the country as a whole is supposed to be going up? So what do you do? For example, you might start your new business as a co-operative. You employ say 20 people, so there are 21 of you and you share the money you make. No one gets more than the others. Everyone works as hard as everyone else. You try to keep the hours you all work to a minimum and you try to pay everyone the maximum for what they do. It’s the New Age formula. When you begin to work in this way you understand what is meant by synthesis; that way you create groups. The energy of Aquarius only works in a synthetic way – through groups. It has no individual application. You have to transform your whole idea of making money and becoming rich. If you do it the Aquarian way you’re not going to become fantastically rich or you are all going to become rich. Maitreya says the economy of a country is like a cart, it needs two wheels: capitalism and socialism. From the Masters’ point of view the best combination is 70 per cent socialism and 30 per cent capitalism. That is the best means for the greatest wellbeing of all the people in the country. Q. In a state park called Hendy Woods, near Philo, California, USA, there have been for three years huge crosses of light shining from the upper windows of a public campground bathroom. Are these authentic crosses of light? A. Yes, they were manifested by Maitreya. Q. Some people speculate that during WWII German scientists were attempting to develop anti-gravity technology. One project allegedly involved a bell-shaped device filled with a mercury-like substance that glowed when powered. This technology was hidden away in mineshafts as were many clandestine scientific projects such as the V1 “flying bomb” and V2 rocket. Over the mine shaft was a large circular structure called the “fly trap” by the US or UK military personnel who viewed the object by photo reconnaissance. (1) Was Germany developing anti-gravity technology for a possible aerial vehicle to win the air war over Germany? (2) Did they succeed? A. (1) Yes – nor were they alone. America and Russia were both involved in the search for an anti-gravity device. (2) To some extent they all did. Q. There is a theory called ‘worm hole’ that suggests there are places within the universe where space and time fold together in some fashion and where it is possible to travel the vast distances of space in a matter of seconds. We have heard that time and space is an illusion, so is this theory accurate at all? A. It is not that space and time ‘fold together’ but actually more simply that time and space at a higher level do not exist; they are an illusion. Those Who are already masters of Space – the Space Brothers – can travel enormous ‘distances’, as we think of it, in seconds of ‘time’. Q. The US Energy Department has just announced a contract to develop the nation’s first new hydrogen bomb in two decades. Teams of scientists in California and New Mexico have been working since 2006 to develop the new bomb, using the world’s most powerful supercomputers. The weapon is known as the ‘reliable replacement warhead’ and is intended to replace aging warheads now deployed on missiles aboard Trident submarines. (1) Are such weapons necessary? (2) Are these the plans of rational, intelligent people? Q. New US bases in the Czech Republic and Poland, and a planned missile defence system, are part of a new ‘star wars’ programme. They will not protect or ensure the safety of these countries. Almost two-thirds of Czechs polled were against the new bases. Some people see all the renewed interest in nuclear energy and weapons as the start of a new cold war or a new period of heightened danger. Could you comment please? A. If this goes forward it would indeed produce a new period of heightened tension especially in Poland and the Czech Republic and of course throughout the rest of Europe. On Saturday 21 April 2007 our group ran a booth at an expo in Pasadena, CA, USA. As it was closing a young African American man in his early 30s walked up looking at our miracles display board. He was dressed neatly in a brown sweater and slacks. He had fine facial features with bright eyes and shiny wavy black hair – quite handsome. When asked his name, he replied: “Christopher.” I repeated it: “Christopher.” “That’s what they call me”, he said, with no discernable accent. I will share parts of our conversation with Christopher as best I can recall. He spoke very rapidly, in a clipped manner with great energy and enthusiasm. He smiled frequently, even when talking about the problems in the world. I asked him what he thought was going to happen. He declined to talk about the future but said: “I’ll tell you what is happening.” He spoke of how things and people are dead or dying. He said: “The oceans are dying. It’s coming to an end.” I agreed but said we can fix it. He spoke as if there was no time left to fix the problems. I said: “You and I can do it.” He said: “My class asks me to fix it and I tell them I can’t. It’s up to them. I am only here to watch.” Then he paused, looked at me and said: “I am the watcher.” He continued to adamantly declare that the world is out of time, repeatedly pointing to an imaginary watch on his left wrist, as if to emphasize that there is no time left – that it’s now or never. That was clearly the main thing he wanted to say. Cher G., a colleague who had joined in the conversation said: “Maitreya said humanity will be on the precipice before we save ourselves.” He agreed and again emphasized that there is no time left. I told him that I am an optimist. He said, “That’s great! We need optimists.” Then he told me to eat “lots of fruit each morning”. Turning to Cher, he said, “I want this guy to live a few more years. He’s a ‘being’. Most people are dead or dying, but he’s a ‘being’.” Cher agreed and I said: “Cher is a ‘being’, too.” He said: “It takes one to know one.” He also told me I drink too much distilled water. He said it was OK, but only part-time. He mentioned a story about Jesus telling a man to fast for only seven days and on the tenth day he would be healed – and he was. Christopher spoke so rapidly and urgently that it is hard to remember everything. He mentioned most of the sacred books of the world’s various religions – just listed them by name as fast as he could talk, one after the other – and said: “It doesn’t make any difference which religion a person is.” And repeated that it is all over – it is all dead, if people don’t act NOW. While Cher and I were talking with Christopher, our co-worker Rekail M. was speaking with another African-American gentleman who seemed, in some ways, quite the opposite of our man. This man was not dressed or groomed particularly well – he looked homeless – had a droopy moustache and a similarly droopy posture and disposition. He told Rekail that he saw Benjamin Creme speak in 1991 and that he saw a being appear over Mr Creme’s face during the overshadowing. He also said that Mr Creme’s words were very important to him. But mostly he spoke of how dark things seem (it was daylight outside), saying: “It’s dark out there. It’s so dark out there. It’s very difficult.” He seemed depressed and said he didn’t know what to do. Towards the end of the conversations, I had the sense that we were being “double-teamed” by Maitreya and the Master Jesus, trying to emphasize the depth of humanity’s plight on Earth and the need for large-scale immediate action. Is that true? Were these gentlemen Masters? D. L., Los Angeles, CA, USA. On the afternoon of 19 April 2007 I was working at the school in Great Ormond Street children’s hospital, London. It was a sunny day and I was taking something outside. A few yards away a moving light caught my eye. 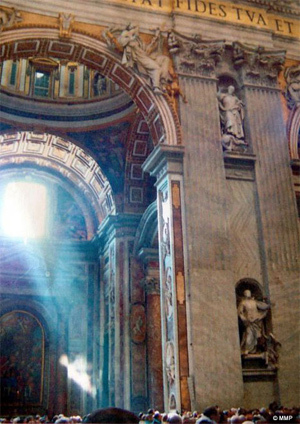 Because of previous experiences of moving lights near light patterns (see Letters, SI Oct 2005) I moved closer, intrigued. What I saw was a large circular light, moving across two walls and on the ground between. I looked around to see if anyone was nearby with a watch or similar to see if that was somehow making the light movement, but there wasn’t and the light was too big anyway. It moved at different speeds, often slowly, sometimes fast and now and then hovered on the ground. It was joined by another light and sometimes they crossed each other. I decided to move to exactly the spot on the ground where the lights hovered and this light movement continued around me until I realised I’d better get back to work! I experienced something similar yesterday evening (14 May 2007), sitting outside my flat on a sunny evening about 7pm. On the wall of the opposite flats were lots of light patterns. On a bush in front of the wall I noticed a sort of quivering light, like a kind of wave. This continued for a while but I had to really concentrate to see it and after a while it became less intense. My phone rang and I answered it, but I stopped mid-sentence when I suddenly saw a large white light shoot diagonally up from right to left, up off the wall into the air and then down again to the left. After the phone call I saw a neighbour and we got into conversation but it was difficult to concentrate on what she was saying because of what was happening behind her! On and around the same wall a few lights moved and then suddenly a large light pattern (a circle with a cross in the middle), which was quite high on the building, suddenly moved right off the wall vertically into the air! It lasted just a few seconds but was quite a spectacle. (1) Were these light movements manifested by the Space Brothers and Maitreya? (2) If so, does it mean that They are manifesting them there and then? (3) Would the movement be visible to everyone? (Benjamin Creme’s Master confirms: (1) Yes. (2) Yes. (3) Yes. Two experienced airline pilots spotted huge UFOs over Alderney in the Channel Islands on 23 April 2007 at 3pm. According to The Guernsey Press and Star, Captain Ray Bowyer, 50, was flying from Southampton to Alderney and when his Aurigny plane was about 30 miles from the island at 4,000ft, he saw a bright-yellow light 10 miles west of Alderney. He reported the objects to air traffic control and filed an incident report. The duty air traffic controller Paul Kelly said a Blue Islands pilot had made a similar report, but nothing had appeared on his radar. Nick Pope, former UFO investigator for the MOD, commented that “pilots are trained observers and less likely than most people to misidentify something mundane. The MOD’s UFO case files contain several reports from civil and military pilots, some of which were correlated by radar. This [the Channel Islands incident] is the sort of sighting that is taken seriously and should be investigated thoroughly”. Ghassan Pattah, a young Chaldean Catholic of 39, passed away from what doctors are calling heart failure. Shortly before his death he told his mother that the Virgin Mary had visited him in visions, and told his brother that he, Ghassan, would soon die. Amira, Ghassan’s mother says that as he became ill the statue of the Virgin Mary in the front garden of their home in Sterling Heights, Michigan, USA, bowed her head and wept. The statue had always looked straight ahead with head erect. A number of people also report seeing a photograph of the Virgin Mary weeping at the time of Ghassan’s death. The family and others say they saw the statue ‘blinking and producing a tear’ in the photograph. “This is a message that we have to change our ways,” said Sal Pattah, Ghassan’s brother. Chaldean Catholics and thousands of people of various nationalities and other faiths are flocking to Michigan to the Pattah home to see the statue and photographs where the miracle took place. “We’ve had hundreds, and I mean hundreds, of people come here to see the Blessed Virgin and say they will quit doing bad things and straighten out,” said Sal Pattah. “Being a Chaldean Catholic and religious is in our blood,” said Shahla Gabbara, who came from Macomb Township to visit the statue and see several of the photos on display. “This is like a true sign from our Blessed Mother that she exists.” The family have placed a Plexiglas box over the statue to protect it, and photographs have also been encased. Amira said her son started speaking to her in Aramaic, the language of Jesus Christ and one that is unfamiliar to Ghassan. He told his mother that the Blessed Mother spoke to him in Aramaic. We present a selection of quotations on the theme of trust – from Maitreya (Messages from Maitreya the Christ, and Maitreya’s Teachings – The Laws of Life), Benjamin Creme’s Master (A Master Speaks), and Benjamin Creme’s writings. The following is a fragment of the compilation. Without trust, a fairer sharing of resources would be a forlorn hope. Without trust, the global decisions required to sustain our planetary home would never be taken. Without blessed and beneficent trust, men would forfeit their right of Stewardship of Planet Earth, and would seal themselves off for aeons from further evolution…. Without trust, Maitreya will emphasise, little can be done. Passports will become a thing of the past. In the coming time, people will be free to enter and to leave any country at will. So great will be the trust engendered by Maitreya’s presence that all doors will be open, and a great and enriching interchange of peoples will take place. Thus, men will learn to know and to love their brothers, seeing them as little different from themselves. In order to love, man must trust. Where trust is not, love cannot be. Love arises spontaneously in the trusting heart, for love is the true nature of man. Learn then to trust and demonstrate the love which is ever ready to shine forth. Trust is the acceptance of life in all its pain and beauty. Trust is the sure knowledge that all is working towards the good, that all is under law, and that that law is administered with justice. Learn to trust and banish fear. Banish for ever the mechanism of limitation and open wide the floodgates of love. Dr Ervin Laszlo is co-founder of the Club of Rome and president of the Club of Budapest – two organizations devoted to working “towards the transformation to a sustainable world”. For Dr Laszlo science and philosophy dovetail; it is imperative that we begin to see our world and all life as interconnected. Dr Laszlo was one of the first representatives in the area of systems philosophy and general theory of evolution, publishing over 70 books and 400 papers, and is editor of World Futures: The Journal of General Evolution. Among his many books are Macroshift: Navigating the Transformation to a Sustainable World; You Can Change the World: Action Handbook for the 21st Century; and The Chaos Point – The World at the Crossroads. In the course of his long academic career as a professor of philosophy and future sciences, he worked in teaching and research at many universities in the US, Europe, and the Far East. He is also a classical pianist and has recorded several piano concertos. Dr Laszlo lives in Tuscany, Italy. Felicity Eliot interviewed him by telephone for Share International. EL: We’re running out of time now. It is better to be safe and we are coming close to the edge of the precipice. And you know what happens if you get too close to the edge, you lose your footing, start to slip and it is very hard to get back up. Dr Laszlo said his estimates and those of many others indicate that we must make significant changes – a real turn around within the next five or so years. Besides, there are all sorts of warnings coming to us from many varied sectors urging change. SI: Could you give some specific examples? EL: For one thing, there seems to be an awareness in the public consciousness which leads us to expect change. Our environment is in crisis and it is giving us very clear warnings that something must be done. We hear daily of some climate-related problems that we need to take seriously. These climate changes threaten the livelihoods of whole communities, huge areas. In fact it affects all of us if our planet is suffering. This is something which we must realize – that everything is interconnected. We are starting to accept this fact. We are seeing water shortages, more and longer droughts; farmers are struggling to produce food. Deserts are growing. Pollution is a terrible problem. Another process which we see is the growing and unsustainable gap and polarization between rich and poor. Look, too, at the levels of poverty and overcrowding in many of the world’s largest cities. So, if you take any one of these and other processes, and look at the real facts and then extrapolate from them, it is clear that we cannot go on in this way. It is impossible. That’s why I, and many others, say that we have reached a crucial moment and it is more than high time for fundamental change. The problem is that some experts and some politicians think we can still deal with each problem separately. They believe that we can take one issue at a time and solve that, then the next and so on. SI: But you don’t subscribe to that approach? EL: No, I don’t. It is not realistic. Everything is inter-linked – all these processes are interlinked. Degradation or destruction in one field impacts on all other systems. Take global warming, the use of fossil fuels, the rates of fuel consumption and CO2 emissions and the impact on our health and on our ability to feed ourselves – let alone leave a viable planet for our children and grandchildren. But we are sacrificing our planet, our health, our children to economics. SI: You’re aware, of course, that certain scientists are saying that climate change isn’t as bad as some allege, that it is being exaggerated – that it is simply doom-mongering. What is your response? EL: I don’t want to name anyone but I happen to know for a fact that there are certain vested interests that are lobbying to suppress information about environmental destruction, climate change and pollution. There are scientists who are being paid to debunk the idea of global warming. The profit motive again. Tanja Cegnar graduated with a Master’s degree in meteorology from the University of Ljubljana, Slovenia. She began her professional career as a weather forecaster before focussing on climatology and its effects on the economy and on people. She has worked for the Climatology Commission of the World Meteorological Organisation (WMO) and the Heat Health Watch Warning Systems projects established by the WMO, WHO and UNEP. She currently leads the Media Committee of the European Meteorological Society. 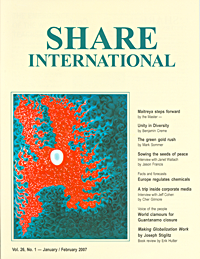 Saso Segula Prosenc interviewed Tanja Cegnar for Share International. The following is a selection taken from various parts of the interview. Share International: Does our lifestyle have an impact on the climate? Tanja Cegnar: It certainly does. And the problem is that we continue to have an influence on it both locally and globally. It is obvious to all that weather processes now are more intense. The number of very powerful hurricanes has increased. There are also very strong Atlantic cyclones, with destructive winds, reaching north-west Europe. If a weather system is more intense, that is to say it has more energy, then there is more energy available for greater extremes. Not all processes are more intense, but the peaks could be more extreme. SI: Do you think this is a result of the warming of the atmosphere? TC: Yes. The significance is that there is more energy in the atmosphere which transforms itself from one form to another. During this transformation the rising average atmospheric temperature is not the only form of climate change caused by an increase in greenhouse gases; there are also greater amounts of latent and kinetic energy available and more energy from whirlwinds. There are also ‘feedback loops’; for example, a summer drought means there is less vegetation, therefore less evaporation, and so more of the sun’s energy heats the air and as a consequence creates higher air temperatures. We saw this in the summer of 2003 in Europe when temperatures soared and large numbers of people died in the heatwave. It is not possible to distinguish exactly to what extent natural oscillations are connected with climate changes due to human impact. There is a great debate about how much of the global and European rise in temperature is a consequence of the increased emission of greenhouse gases. It could mainly be due to this, but partly also a consequence of normal natural variations. SI: What is your comment on the assertion that weather patterns don’t exist anymore? TC: I don’t agree; we used to say that there was a certain constancy in weather but nowadays there are rapid changes from warm to cold and vice versa, but we still have weather patterns. Maybe it would be better to say that a certain type of weather is more frequent in a certain period, or that we have rapid weather changes, which is what disturbs people the most. These changes have always existed but people are sensitive to their increased frequency. We notice this and it disturbs us much sooner than when the average temperature changes by a half a degree. If this year’s summer is actually half a degree Celsius warmer than last year’s an ordinary person doesn’t realize this…. SI: It seems that North America has been suffering from severe climatic changes, and yet the USA reacts to climate change very slowly. TC: The USA has had a series of weather-related tragedies, heatwaves, floods, tornadoes causing enormous damage and often high mortality. They cannot ignore the climate situation. I’m convinced that the main barriers to taking action to prevent climate change lie in the economy. For superpowers, people are still less important than their own economic interests. Citizens are important only at election time, to grant politicians new mandates. On issues of fossil fuels and the consumer lifestyle, the interests of great multinational corporations dominate, and these are driven by profit and nothing else. Changes can only be brought about by consumers, by their refusal to buy the products of certain companies. On a global level, some multinational corporations have started to make products that reflect the companies’ ecological awareness. Perhaps climate change will sooner or later be included in the electoral programmes of politicians. This process evolves relatively slowly because it requires a change of the mind-set of voters, and consequently also of politicians, multinational corporations and consumers. At international conferences the African delegates always say: “You can play climate change, but we are hungry. We have to survive.” There is a terrible gap between developed and developing countries. How do we help these countries to improve conditions? Developed countries should provide them with modern technologies. SI: So, we have to do two things. Firstly, ordinary people need to become aware of the problem and put pressure on their governments. And secondly, developed countries should start to help underdeveloped countries more generously. TC: Yes. I can’t say that such help doesn’t exist, but it is too limited and often help isn’t provided efficiently enough. There are many international aid programmes for underdeveloped countries, but to what extent? Just look at China: it has a population of more than a billion people. Look how fast they are developing. The EU sets very ambitious goals for restricting greenhouse gas emissions. I mentioned China due to its enormous population, its extremely fast rate of development and its rising greenhouse gas emissions. While most Chinese can only dream about it, their goal is an American way of life. People in India have similar wishes, although they are developing less rapidly than China. Africans will also sooner or later want to achieve the same standard as others. There are millions of people who want to achieve our standard of living. This means an enormous increase in the number of new cars and electrical domestic appliances, an increase in energy needs, and a corresponding increase in greenhouse gas emissions. The Kyoto Protocol is urgently needed, along with additional restrictions. But this is only mitigation. Climate change will happen, if only due to the greenhouse gases that have already been released into the atmosphere. Climate change is a serious and neglected factor in ‘environmental migration’. We cannot ignore the migration of masses of people who are forced to migrate due to worsening climate conditions. The situation is already bad and in the future it will only get worse unless we act. Desert areas will spread. Some areas will be flooded so frequently that they will no longer be habitable. This includes all of the major river deltas, which are very low lying and densely populated. Climate anomalies can also destabilize national economies which increases the possibility of political destabilization. On the one hand, we have environmental migrants, while, on the other, there are political migrants. Both can be closely related. In Central America, for example, we have seen how natural catastrophes can destabilize a country – economically and politically. The same pertains in Africa: in the Sudan and Darfur there would be fewer conflicts, or they wouldn’t be as intense, if people had access to aid. We should bear in mind that conflicts will be more frequent in the future. A shortage of drinking water could also lead to conflict. The 2007 BBC Reith Lectures were given by American economist Professor Jeffrey Sachs, Director of the Earth Institute, author of The End of Poverty, advisor to governments and international agencies on the problems of poverty reduction, debt cancellation and disease control for the developing world, and special advisor to UN Secretary-General Ban Ki-moon. In his five lectures, entitled ‘Bursting at the Seams’, Jeffrey Sachs addressed the complex challenges and choices facing humanity in the 21st century. The following is a selection of some extracts. With as many as 450,000 dead and 2.3 million displaced in the war-ravaged region of Darfur, demonstrators worldwide have staged a Global Day for Darfur to protest against Sudan’s failure to end the genocide against non-Arab ethnic groups in its western province. On 27 April 2007, the fourth anniversary of the start of the conflict, events took place in 35 capital cities around the world. Protesters in London, including politicians and celebrities, gathered outside Downing Street with 10,000 hourglasses filled with fake blood to highlight the continuing violence in Darfur, where “blood is running like water”, according to Amnesty International’s Kristyan Benedict. A letter to Prime Minister Tony Blair urged him to keep up pressure on Sudan to allow “an effective peace-keeping force on the ground protecting civilians”. In New York, a week of action included a protest in the city’s financial district targeting major investment firm Fidelity, the main shareholder in China’s giant PetroChina Company. With China buying half Sudan’s oil and blocking international peace moves, critics believe that Sudan’s President Omar al-Bashir can afford to ignore international pressure. “We want to show Sudan that the people of the world are outraged, and that they are willing to pull their money out of enterprises that support this murderous regime,” said Helga Moor of the Darfur Vigil Group. Events on the African continent included a day of cultural events in Cairo, attended by Sudanese and Darfurian refugees, which included interviews with Darfurian victims in the documentary Jihad on Horse Back, a Human Rights Watch exhibition of child victims’ drawings, and a concert of Darfurian music and dance. Social movements representing Brazil’s landless and homeless people stepped up their protests in April 2007 to call for swifter action to tackle the country’s endemic poverty. In Sao Paulo, for instance, the tiny rooms of one decaying 22-storey building, Prestes Maia, house 460 families living under the daily threat of eviction – this despite President Lula da Silva’s programme of reforms which has redistributed land to 400,000 families and has earmarked billions of dollars of government funding for housing and sanitation. Now, however, the country’s social groups have come together in an informal coalition to criticize the government for being too slow to address poverty and to take on Brazil’s big landowners. In the countryside, the landless workers’ organization MST (Movimento dos Trabalhadores Sem Terra) – one of Latin America’s most effective social organizations – occupied the government’s land reform agency, while in the cities various groups were led by the Movimento dos Trabalhadores Sem Teto (the organization of the “roofless” or homeless) in illegally occupying empty buildings.